My garage was pretty tidy but not the way I wanted it. I wanted a practical solution to be rid of the pesty mice and my storage requirements but at the same time something that looked great every time that I went into my garage. WOW, Nuvo Garage pulled it all together by designing the space and then finishing it by integrating all elements. No detail was overlooked, right down to including a small metallic flake in the floor to compliment the stainless steel cabinets and aluminum sidewalls. 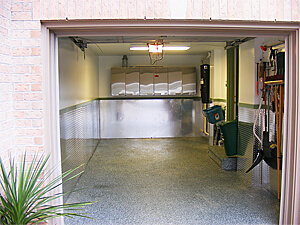 My garage looks spectacular and easily accommodates my car…and no more mice! Sometimes the garages I transform are not obvious candidates for a makeover. My client, a professional single woman, didn’t have the usual issues. There wasn’t clutter everywhere. Her single-car garage was fairly tidy and there was room to park her vehicle. But the overall appearance of the garage was not in keeping with the rest of her home. The interior of this older town home had been updated and decorated but the garage was still showing it’s age. It hadn’t had a fresh coat of paint in years and it was looking tired. The walls were scratched, the lighting was not adequate and there were holes in the drywall, which provided an open invitation to the local mouse population. My goal was to evict the mice and seal up their entrance as well as freshening up the garage and making it a brighter, more inviting part of the home. The first job in the garage was to seal the holes in the drywall to ensure the mice would not have access. With that problem solved the floor was a priority for my client. I built a new entry step into the house and finished the floor and step with polyaspartic coating. This type of floor coating is low maintenance and eliminates the dust that comes from bare cement floors. The addition of a 4-foot band of punched aluminum wainscoting on the walls provides a water seal and protection for the wall from scratches when the car door swings open. A bit of sparkle mixed into the floor coating is a perfect complement to the shiny stainless steel wainscoting and instantly brightens the space. Installing new T8 fluorescent lighting also brightened up the interior. These tubes are the preferred bulbs for a cold climate. They turn on instantly with no initial flicker as well as being energy efficient. Paint can also do wonders to brighten up the garage. A coat of bright white paint on the walls and ceiling makes the space look clean. The addition of a painted green border above the aluminum sidewalls as well as around the door trim ties the design of the space together and picks up the green fleck in the flooring. 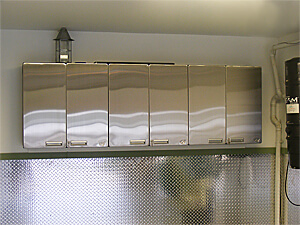 To complete the clean look, I installed stainless-steel Hercke upper wall cabinets on the rear wall to neatly store gardening and car supplies. An area of slatwall provides hanging storage for long-handled gardening tools. And slatwall on either side of the entry door keeps garbage and recycling neat and easily accessible from the house. A little paint, new flooring, lighting and a little slatwall completely changed the look of this garage from old and dreary to a fresh, decorative space.